Jockey Men’s Morris Club have been active in Birmingham since their formation in 1949. 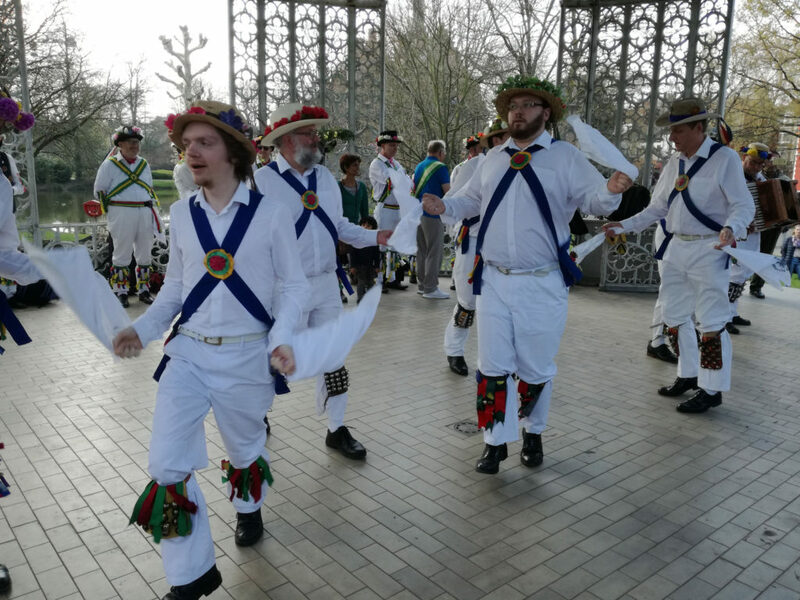 They have performed all over the country and have been proud to represent morris dancing, and the City of Birmingham, in places as far flung as Warwickshire, Devon, France, Flanders (many times), Cyprus, Holland and Germany. Our last foreign trip saw us performing in Mortsel, Flanders, before dancing at an event called Parkfeesten in a town called Sterrebeek – on the outskirts of Brussels. We like to keep our national folk tradition alive both at home and abroad. If you’ve ever thought that you might like to have a go at morris dancing why not get in touch with us. You will be able to do this by visiting our contacts page. We will be able to supply you with more about information about our group and answer any questions that you may have about Jockey or Morris Dancing in general. We have strong links with many other sides. The above photographs show Jockey dancing at Sint Niklaas in Flanders, in glorious sunshine, during trip to visit Boerke Naas Folk Dance Group in March 2019.